"A New Age Has Come." In this Marvel superhero movie, the famous team of superheroes is tasked with stopping the world-dominating plot of a super-powered robot that was inadvertently created by Tony Stark. The second in the Avengers sub-franchise, the sets up some of the events that would form the plot foundation of Captain America: Civil War. 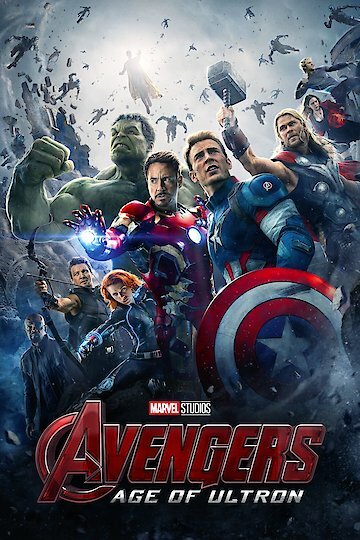 Also starring Robert Downey Jr.
Avengers: Age of Ultron is currently available to watch and stream, download, buy on demand at FuboTV, Sling, Amazon, Vudu, Google Play, FandangoNow, YouTube VOD online. Lindsey Morgan of 'The 100' might not be the frontrunner after all. Find out how this weekend's movies fared at the box office. The guy at #2 might surprise you though. Wait until you see Jeremy Renner's major mullet. Does the new "Avengers" movie live up to the Marvel movie standard? The "Avengers" actor made it clear he didn't like the way the questioning was going. Renner did a hilarious parody of Ed Sheeran's "Thinking Out Loud" as "Avengers" hero Hawkeye. When you take out the post-production editing, superhero movies are pretty ridiculous. Yeah, right. Like anyone is going to listen.